Sheldon Richardson had two sacks to lead the defense’s game-long stifling of Aaron Rodgers, and the Vikings (6-4-1) pushed the Packers (4-6-1) further back in the NFC wild card race. With Randall Cobb out (hamstring) for a sixth game this season and rookies Equanimeous St. Brown (elbow) and Trevor Davis (hamstring) forced out in the second half, Rodgers didn’t have much to work with down the field. Left guard Lane Taylor (quadriceps) departed in the first half and left tackle David Bakhtiari (knee) was sidelined in the second half, leaving the protection shaky at best. Rodgers finished 17 for 28 for 198 yards, without a turnover. The Packers failed to move the chains on eight of 10 third downs. 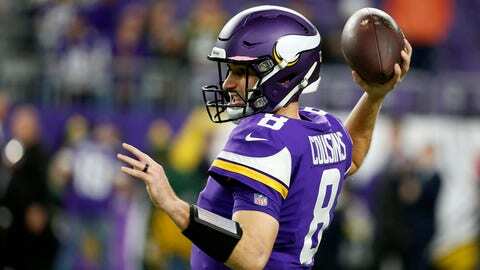 Jones was stuffed on fourth-and-inches by Harrison Smith, Danielle Hunter and Eric Kendricks midway through the third quarter, giving the Vikings the ball at the Green Bay 44. That set up a 37-yard field goal by Dan Bailey for Minnesota’s first lead of the game. Bailey’s wide left 48-yard try wasted another highlight-reel catch by Thielen in between Alexander and Josh Jones that went for 33 yards. Later in the second quarter, after some mismanagement of the clock, the Vikings had to hustle to set up a 51-yard kick for Bailey. That one was good, but Rashod Hill was called for a false start. The 56-yarder sliced right, the fifth straight missed field goal against the Packers after rookie Daniel Carlson went 0 for 3 in Green Bay and was cut the next day. The announced attendance of 66,872 was the largest for the Vikings in three years at U.S. Bank Stadium. A handful of Minnesota players were introduced in the first quarter with Paul Bunyan’s Axe, the trophy the Gophers repossessed from the rival Badgers in Wisconsin on Saturday to end a 14-game losing streak. Randy Moss kept the crowd fired up in a halftime ceremony to receive his Pro Football Hall of Fame ring. Vikings: RT Brian O’Neill left in the third quarter for evaluation for a possible concussion. … CB Xavier Rhodes limped off with an apparent injury to his right hamstring in the fourth quarter.